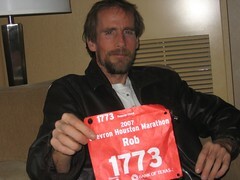 Rob ran the marathon in 3 hours and 3 minutes - not as fast as he would've liked but not bad considering the weather. More later. Had a huge dinner at Spaghetti Warehouse. Could go straight to bed now - but won't. We are trying to figure out what the weather is going to be like in the morning - it seems like the front has speeded up and it's going to be cold and rainy instead of warm and rainy. Rob says if it's too terrible he's staying in bed! But that would be very unlike him. I will be very surprised if he doesn't run. If you want to check up on him, his race number is 1773. Or I think (based on past years) that you can probably also look him up by name. The website is here. I feel so scattered lately. And the bad thing is, I'm always scattered, so for me to notice it it's got to be even worse than usual. I don't know what to make of that, I just thought I'd throw it out there. On that cheery note... We will be busy this weekend, so hopefully I won't have too much time to brood. I feel kind of broody right now (as you can probably tell), but I'll get over it. I always do.